On Thursday, famed game developer Sega unveiled its plans for the rest of 2010, including the return of a certain speedy blue hedgehog and the company’s plans for Apple’s iOS Game Center service. In a press event, Sega demonstrated several new games, including the long awaited Sonic the Hedgehog 4 title designed for the iPhone. 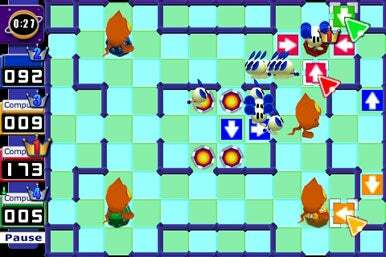 Later, Sega also revealed that Dreamcast puzzler ChuChu Rocket would be the first game developed by Sega to utilize Game Center’s social services, and that most games going forward would utilize the service. Released as part of the iOS 4.1 update, Game Center connects gamers with their friends, lets them earn achievements, and find opponents online. While Game Center’s potential is formidable, so far the service has been marred by a lack of titles. It’s encouraging news for gamers that big developers like Sega and Namco are actively adapting to the service. If you said ten years ago that the sequel to the popular Sonic franchise would be built for your phone, I would have thought you were crazy. But here we are, 16 years since Sonic the Hedgehog 3 came out, and Sega is developing the latest installation in the arcade platform series for the iPhone. While other platforms will also enjoy the game, at Sega’s San Francisco offices on Thursday it became increasingly apparent that the game was designed with the iPhone in mind first and foremost. Sega’s VP of Digital Business, Haruki Satomi, made a point of saying that the company has faith in the iPhone platform and chose to release the latest Sonic on the iOS rather than the Sony PSP or the Nintendo DS. 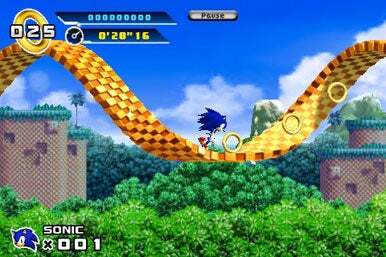 The iPhone version of Sonic 4 will also offer two exclusive levels not available on other platforms. The two zones we were shown demonstrate that Sega’s developers have taken fan suggestions to heart. There aren’t any extraneous characters (sorry Big the Cat), slow side quests, or annoying werehog levels. The game only has you playing as Sonic in a variety of fast-paced, lush worlds. You’ll bounce off platforms, run down hills, spin dash through walls, and even fly down zip-lines. The iPod Touch I played on didn’t suffer even a slight hiccup—the frame rates were high even during some of the faster paced segments. The two levels we played were The Splash Hill Zone, revealed earlier this year, and the recently unveiled Labyrinth Zone. The latter forces Sonic to navigate several watery-Mayan-influenced passageways. Despite the ancient setting, Sonic’s pace doesn’t wane as he still manages to speed through the spear-infested traps and Indiana-Jones-inspired temples. The Sega team has also learned some new tricks. Instead of plotting a linear game where you advance from stage 1 to stage 4, once you’ve beaten the Splash Hill Zone you have a choice of several worlds to explore. Each one has three missions and can be beaten in any order. After you’ve beaten every mission in a world, you’ll unlock the boss fight to advance. Sega’s developers wouldn’t reveal the story arc of the game, but they assured us that you’ll want to collect all fragments of the chaos emerald in order to unlock a “cliffhanger” cinematic that sets up the second episode. To be honest, I haven’t been a huge fan of the iPhone ports of the earlier Sonic games, so I was extremely skeptical going into the demonstration. But after playing through several of the worlds (which I cannot reveal here) I have to say that Sega has finally gotten it right. The virtual joystick handled intuitively and Sonic was able to run, jump, and stop when I needed him to. Even during the more platform-intensive levels, I never had the controls to blame for my dying. Sega has created some pretty great playgrounds to play around in—fans of the series will enjoy the familiar feel of some levels while new fans will appreciate the intuitive controls and addictive gameplay. Imagine a vast MMO complete with alliances, city building, resource gathering, and trading. Now imagine a dungeon crawler with leveling, loot, and intense button-mashing combat. Giving players the best of both worlds, Sega’s Kingdom Conquest is the company’s first foray into the “freemium” pricing model pioneered by ngmoco. You play as an adventurer aspiring to become the new ruler of Magna Gul, “the land of monsters.” You’ll have to ally with and work against other players to build up your monster army and capture more territory. The interesting element of Kingdom Conquest is that it seems like a simple strategy MMO like FarmVille or We Rule (4.5 mice). During the demonstration, a Sega representative built a lumber mill next to his forest square and discussed how you could purchase items via in-game transactions that would speed up build speed. You can chat with friends, ally with players, invade territories, and build up your army. This is all pretty typical stuff. But what came next during the demonstration surprised me. There’s also an Action Mode that allows players to go into dungeons (with up to three friends), obtain loot and hack & slash their way through various baddies. 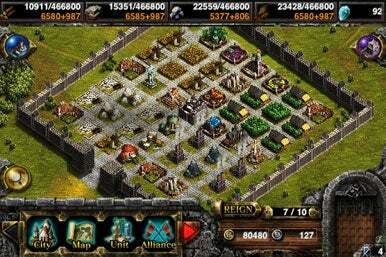 Items and currency obtained during these action segments will help further expand the player’s empire. For example, defeating a certain dungeon will allow a player to unlock a monster card that they can then produce in strategic mode. While the dungeons aren’t particularly robust (in fact, the level we saw was essentially just four circular rooms and several easily-handled bats), it’s still the first game outside of Brutal Legend I’ve seen that has both strategy elements and hack & slash segments. Sega boasts that there will over 100 monsters to unlock and the monster’s strengths and abilities can be customized and will have a direct impact on battle. It’s an encouraging thought that serious strategy fans will have an answer to the Farmvilles of the world, but the promise of also having dungeon crawling (even moderate areas) will appeal to even larger audiences. Fans of Sega’s Dreamcast platform are often a neglected bunch, but on the iPhone and iPad touch, they’ll get to see one of their cult favorites remastered. ChucChu Rocket is a Japanese cat and mouse puzzler with a uniquely adorable aesthetic. You need to guide mice safely to their rockets by placing arrow squares strategically throughout the room. But watch out! There are cats around and they want nothing more than to ruin your plans and eat the mice. With over 145 puzzles in four difficulty modes, ChuChu Rocket will offer plenty of gameplay for puzzle fans. ChuChu Rocket will also offer the opportunity for up to four players to battle simultaneously via Bluetooth or Wi-Fi across twenty-five multiplayer levels. During the demonstration we watched as players strategically placed arrow points that harmed their enemies at key times, then watched as fortunes reversed when special mice changed the rules of the game. ChuChu Rocket may be the first great party game for the iOS platform. Twenty-two years ago, video game cabinets could be found at major malls across America. Games like Golden Axe and Altered Beast would liberate quarters from teenagers and offer brief respites from the terrible pop music that stalked the late 80s. It was a simpler time. 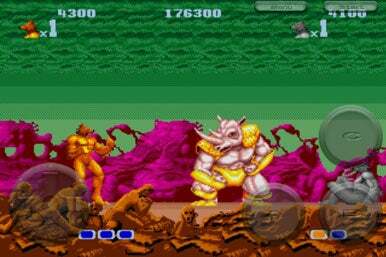 Now, Altered Beast’s classic arcade action is coming to the iPhone. You play as a resurrected centurion sent by Zeus to rescue his daughter Athena from the evil shapeshifter, Neff. In human form, you’ll punch and kick your way through hordes of undead and seventeen types of demon. But in transformed beast form, you’ll be able to utilize powerful special attacks that will help even the odds. Altered Beast is renowned for its old-schooll beat-em-up gameplay and the ability to play as a Werewolf, Werebear, Weretiger, Weredragon or Golden Werewolf. This mythology-infused action game will offer up to two-player multiplayer action via Bluetooth. Look for this classic title later this fall. 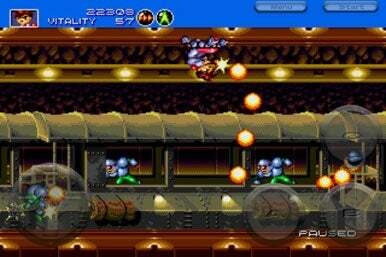 Gunstar Heroes was a brutally difficult side-scrolling shooter released in 1993 on the Sega Genesis. Now due out for a fall release on the iPhone, this addictive sci-fi title will find new life on a platform devoid of good shooters. In Gunstar Heroes, you play as one of two Gunstar twins who must protect planet Gunstar 9 from the evil Colonel Red. The game features iconic 360 degree shooting (reminiscent of the popular Contra series), hordes of enemies (including 25 boss battles), two-player action (over a Bluetooth connection), and close quartered combat (in addition to shooting you can throw, slide, and combine your weapons to make 14 different weapon combos). Aside from Sonic, this was easily the most popular game to be shown at Sega’s press day. The combination of old school shooter action, plentiful explosions, and brutal difficulty had many of the assembled press waxing nostalgic for the golden age of gaming. Look forward to this chaotic war game this fall.